The apartment was completly renovated in 2013. It has comfortable high quality boxspringbeds in which you will find relaxing sleep. 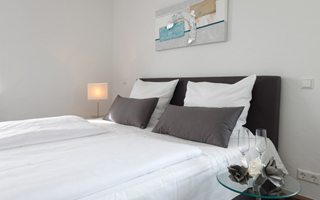 The apartment is located directly besides Hotel MARIS, 70 m away from the lake Steinhuder Meer. In two of the bedrooms there are comfortable boxspringbeds for a relaxing sleep. In the third bedroom there are two beds build in the pitch of the roof for the kids. 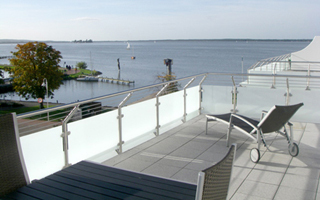 The apartment is located directly besides the Hotel MARIS, 70 m away from the lake Steinhuder Meer. Wake up with a free view on the lake Steinhuder Meer. Enjoy wonderful sunsets with a glas of wine on the big sun terrace. The apartment is located on the 2. floor (with elevator) and has modern and high quality furniture. 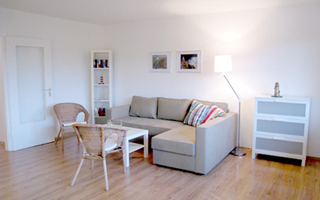 The apartment is located in the centre of Steinhude - Am Anger 7 - app. 150 m away from the lake Steinhuder Meer. It is on the 2. floor and has a nice balcony (without elevator). In the living room there is a sofa with sleeping function which is suitable for two persons. The apartment is fitting for up to four persons.